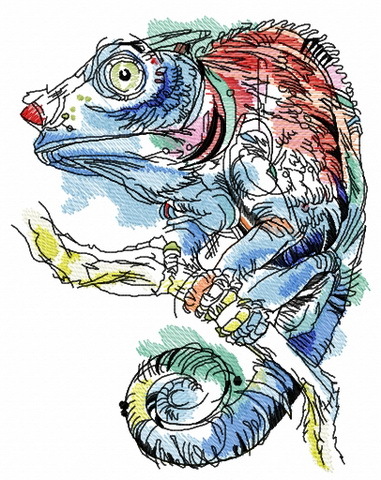 Why do I include this Lizard design in the same way with the imitation of watercolor painting? Firstly, they are very well combined with bright floral fabrics, and secondly, after embroidering the patterns, I saw that these designs mimic the lightness drawing with watercolor or pastel pencils, and in dragonflies and butterflies, spirals and light strokes are an imitation of flight. 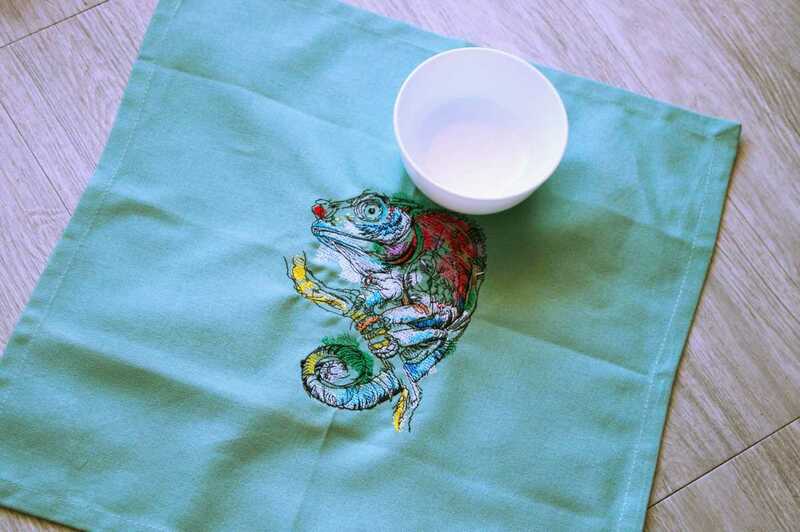 Watercolor embroidery are very light, you can embroider on any materials. Curtains, organza, atlases, all kinds of silk, knitwear, etc. The color palette can be any as desired. You can choose any even non-realistic colors. 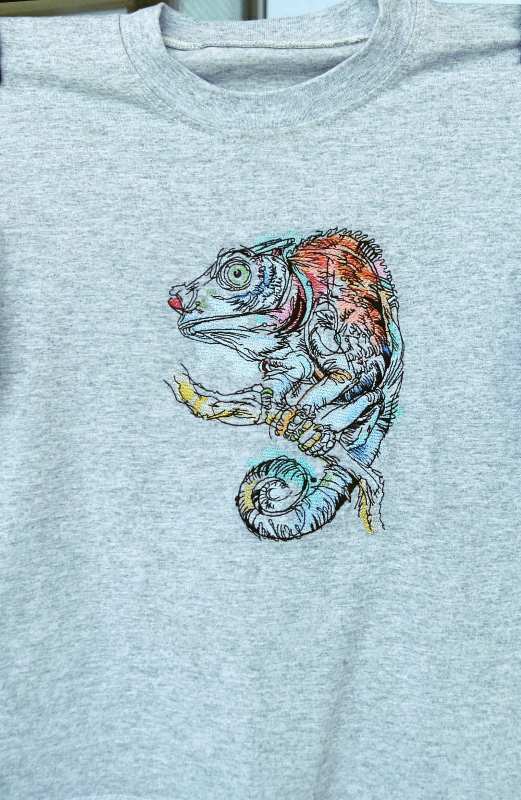 Using different sizes, the ability to rotate and mirror effect (have in any embroidery machine), you can get an intuitive name solution with just one design. A separate topic is the search for a contrasting version, embroidering on black fabric and using bright and even fluorescent colors. On the photos there is a sewn-out test design sample. Designs made in this style are convenient when using thin or capricious fabrics. 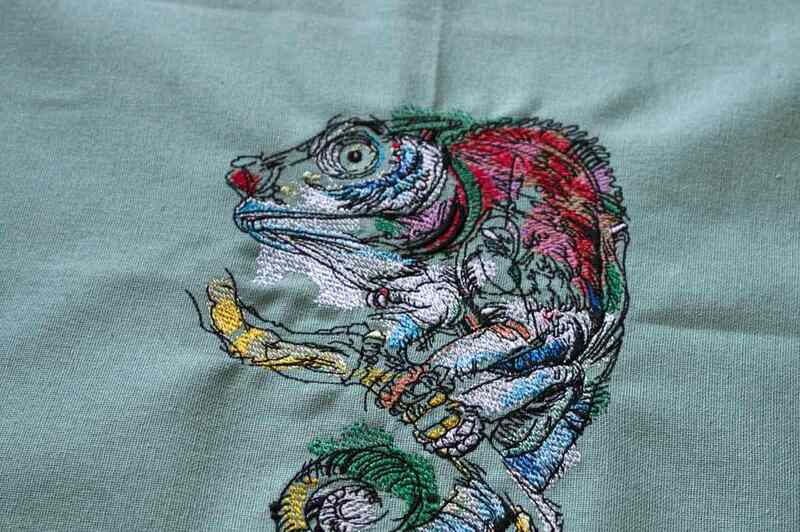 Indeed, embroidering a gift on a thin T-shirt you do not want to risk, will the contours coincide? Will there be a large deformation and shrinkage of the tissue? 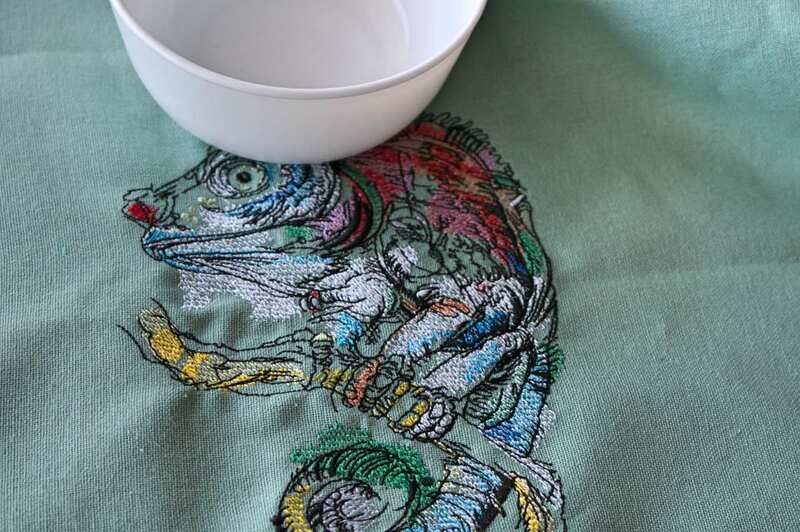 The output is simple to choose Chameleon embroidery where there are clear contours, and any bias or deviation will look like an artistic effect. Then we need such embroidery. I call it in style a sketch or imitation with watercolors. In it, as a rule, the tissue itself is the main layer (like the application). Another plus - the colors can be chosen any .. the brightest and most unusual, the exception is the contour itself, it should be black or dark. These are hands down the most adorable things I have made on my embroidery machine so far! Love! This chameleon design are going to be perfect! 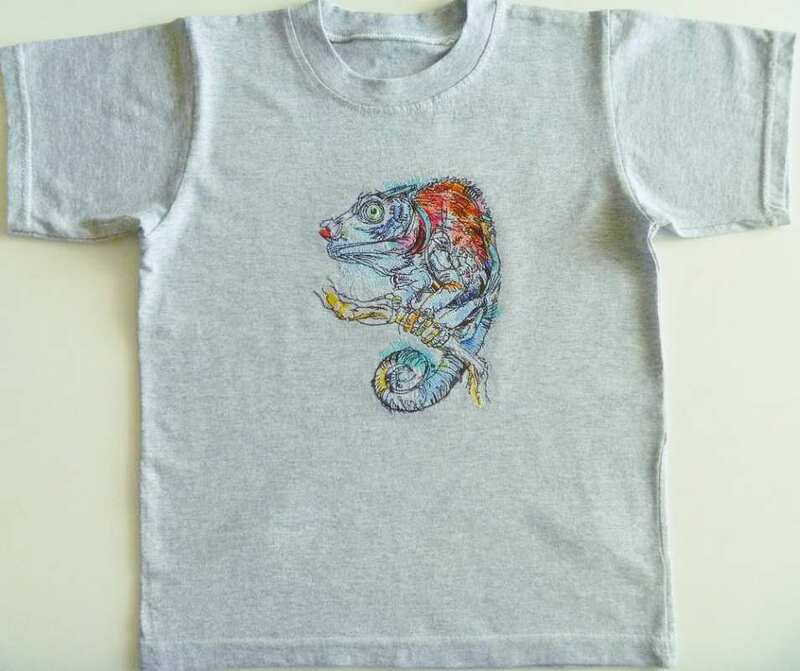 In the photo that made our user - an embroidered T-shirt with a chameleon made in the style of a watercolor drawing. This design has easy stitches with stitches allowing it to be used on virtually any fabric, including very thin ones. These fabrics are most often used for summer t-shirts. To avoid deformation, it is better to use a stabilizer. 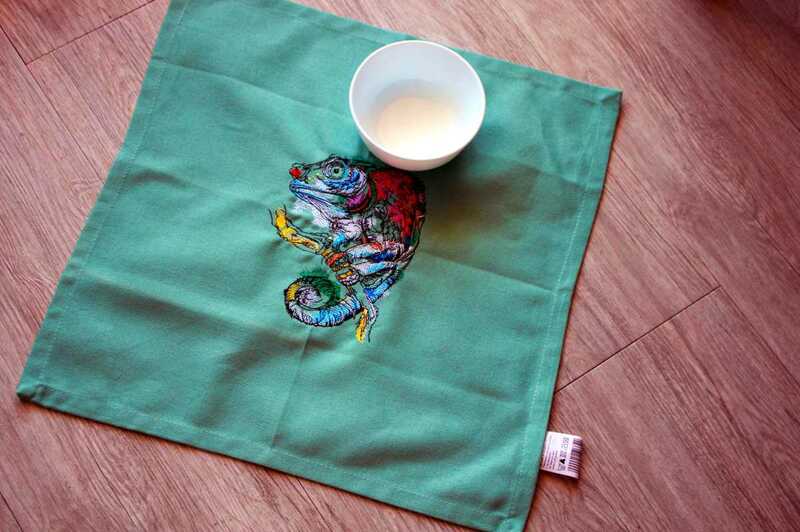 Because the design is bright and not tied to specific colors, you can use very bright threads, getting almost incredible results.